Dan Pearson’s work in Kings Cross continues. 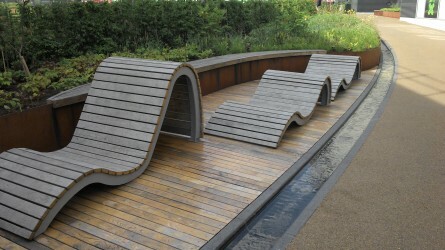 Following up on his garden for the British Library, Dan Pearson has now completed Handyside, the first proper garden to be designed within the new residential areas being created at the back of Kings Cross. This gritty, rather unsalubrious urban backwater, has long fascinated me. I have been following with excitement the evolution of the area into what surely will become an exciting arty enclave. When I learnt that Dan, who is nothing short of a God for me, was creating a garden there, I decided to go on a pilgrimage. 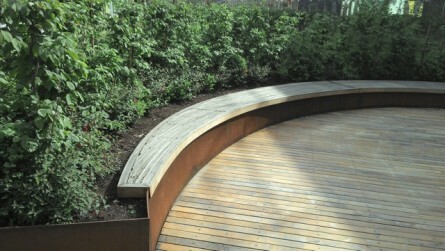 As you can see from the photos, taken in late April, the design is based around generous raised beds which create a sense of movement through the garden and divide the space into separate areas, including plenty of spaces to sit, either on built-in benches or sensuous freestanding loungers. 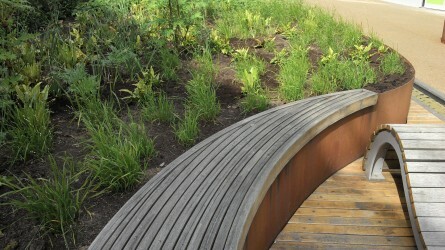 The organic, curvaceous shapes and romantic planting bring a sense of naturalness (is that a word?) into an area which is everything but. 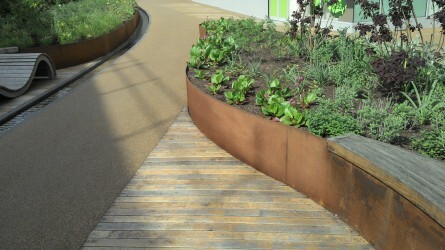 The raised beds are made out of CorTen steel. This is clever because the material lends itself really well to creating the curvaceous shapes but also, conceptually, it links to the industrial past of the area. There is also a children’s playground, which is a lovely thing to see in a place like this, where there is no other provision for them. The day I visited, a week day, the place was populated with kids playing and their carers looking on and chatting. I wonder if the interesting design of the playground, which also incorporates a steel pergola covered in vines, will seep into their subconscious and give them an appreciation of good design, often lacking in your average, unimaginative, run of the mill playgrounds we see everywhere in the country. On a personal note, I was chuffed to see that the planting combinations he used are almost identical to the planting I designed for a new scheme in the Midlands, with the help of Chris Marchant from Orchard Dene, so I must be doing something right! 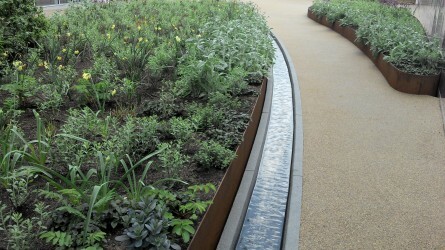 Dan Pearson Studio has delivered in Handyside a clever and considered design, which interprets the site’s historical past and translates it into a vision for the future, where plants, nature and good design enhance people’s lives.